President Muhammadu Buhari says the ongoing fight against corruption has started yielding fruitful results as Nigeria is now a respected nation in the world. 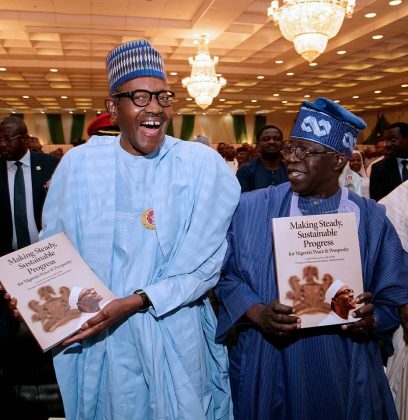 The President stated this on Thursday at the public presentation of a book titled; Making Steady, Sustainable Progress for Nigeria’s Peace and Prosperity in Abuja. It is a mid-term scorecard on Buhari’s administration at the Presidential Villa. Buhari stated that the nation’s creditworthiness was sound, noting that the country’s first Euro – Bond offer was over-subscribed four times. He said that the Nation had gone through difficult times due to World–Wide Economic Recession. The President noted that Nigeria was coming out of recession and government’s efforts were aimed at easing economic hardships with more jobs, social security platform for vulnerable families and unemployed as well as infrastructural projects. He said that his administration would continue to address the recurring issue of herdsmen and farmers clashes, kidnapping and armed robberies. “We are all aware now, if you steal public funds and are caught you will face the law,’’ he said. Buhari lauded the efforts of the Presidential media team for organisng the event. Vice President Yemi Osinbajo, who also spoke at the event, identified humility and prudent management of public resources as the greatest assets of President Buhari.